Named for its bright gold color, Golden Bear ammunition features brass-coated steel casings. Brass-coated steel delivers smooth, brass-like feeding and function at an affordable price. Golden Bear ammo is produced by the JSC Barnaul Machine-Tool Plant located in Barnaul, Russia. The company is best known for manufacturing rounds for the Russian military and is considered the premier munitions factory in Russia. 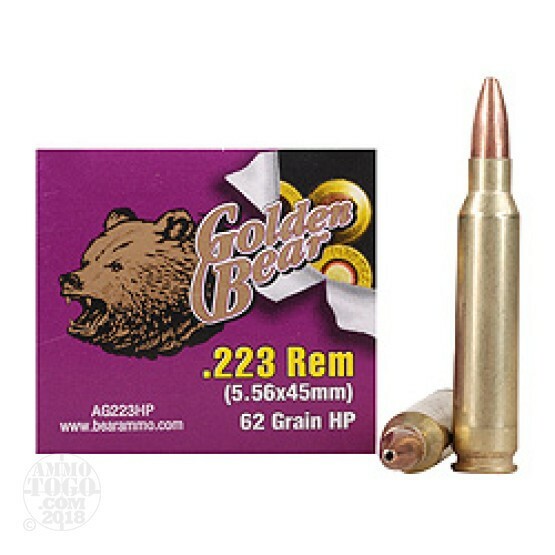 Ideal for the stocking up, this package contains 500 rounds of Golden Bear .223 Remington ammunition. Each round is loaded with a 62 grain hollow point projectile. These HP rounds leave the muzzle 300 feet per second and deliver 1280 foot pounds of hard-hitting muzzle energy. Delivering excellent terminal expansion, these loads are perfect for home defense or small game hunting. This ammunition is factory fresh and features non-corrosive Berdan primers. The primer is sealed for moisture protection, making them perfect for long-term storage and all-weather shooting.